this wrap coat – of the three coats pictured, this one would probably get the most mileage. the daily driver! this balloon-sleeve blouse – this blouse would work for work and weekends, and update your closet with a modern, elegant flair. this asymmetrical button dress – taking the hit style of summer and making it work for Fall. this brown turtleneck sweater – the same color as my Fall pumps, this is what is going to be my hit color for the season. this blush turtleneck – I especially love it paired with the floral skirt below. this printed skirt – cream and black works well with Fall’s deep browns and camels. this floral skirt – a feminine floral with romantic layers. this faux fur coat – so cozy and luxe! this v-neck sweater – this oversized boyfriend cut will be great with leggings and jeans. No. 5 for the win for me – would wear that sweat ALL DAY!! You picked wonderful pieces for really less money! Thanks a lot! In love with your selection of pieces! 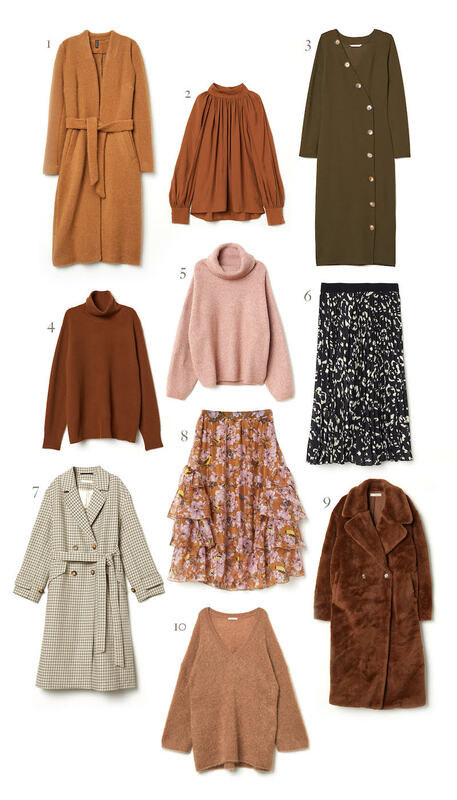 Loved all of these beautiful fall fashion pieces, especially those cozy sweaters and the chic coats <3 🙂 I can't get enough of this color palette! That plaid coat gives me life!